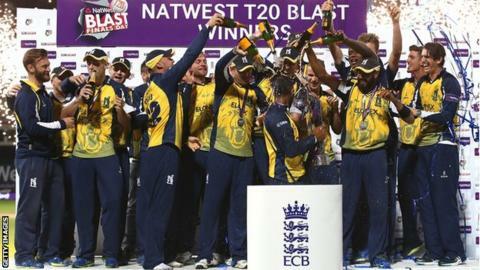 Warwickshire will play Kent at Edgbaston in the semi-finals of the One-Day Cup as they continue their quest for the treble. The Bears, who beat Lancashire to win the T20 Blast on their home ground last weekend, will entertain the Group B runners-up on 4 September (14:00 BST). In the other semi-final, last year's 40-over competition winners Nottinghamshire will travel to Durham. That tie will take place on Saturday, 6 September at 10:30 BST. Kent captain Rob Key said: "Away to Warwickshire is a chance to play at one of the great grounds in England. "At this stage of the competition they are all good sides. It will be an excellent opportunity for all our young players."